Giouvarlakia, pronounced yiou-vahr-LAH-khia, is a Greek soup with meatballs using ground veal (or ground pork or chicken), rice, herbs and spices. After cooking the meatballs we add the avgolemono, which is an egg and lemon sauce, which thickens and becomes a delicious soup. In the minced meat we add some starchy rice, called Carolina, herbs and spices and form the meatballs. You can coat them with floor if you like, as this also helps thicken the sauce. When shaping the giouvarlakia, make sure that they are all the same size, in order to achieve cooking them the same time. Half an hour is enough to cook them and then add the avgolemono sauce, which should be tempered so as not to cook the eggs. The soup should then rest for about 10 -15 minutes so that the avgolemono sauce thickens. 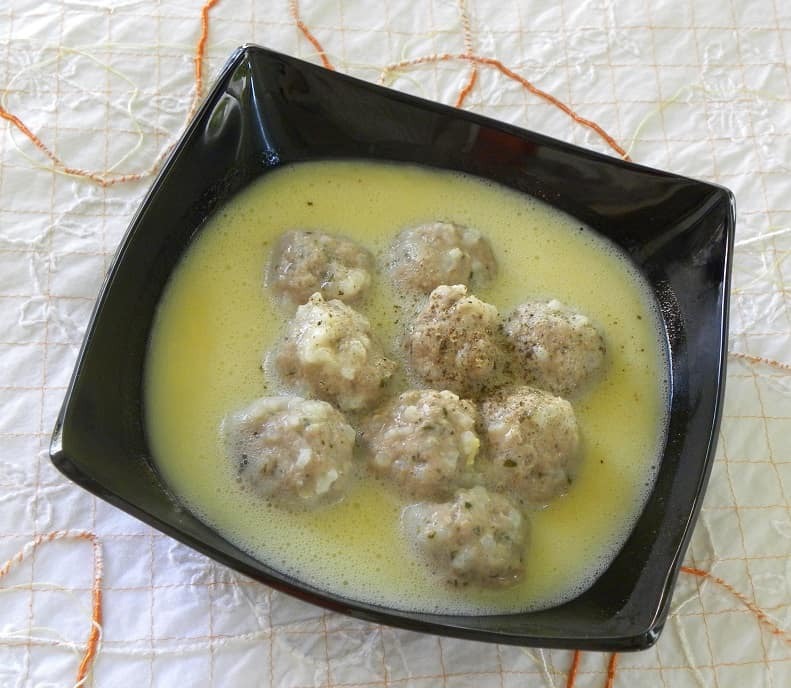 Some people consider Giouvarlakia a “meatball soup” and the broth is not thickened; others consider it just meatballs with Avgolemono sauce, and cornstarch is added, so the sauce becomes a thick cream. I always make it as a soup and during cold winter days it is a wonderful comfort dish, light and tasty and will warm you up in no time. You can also cook them in a tomato based soup, but these ones with the avgolemono are the most traditional and the ones I like the best. Giouvarlakia, pronounced yiou-var-LAH-kia, is a Greek soup with meatballs using ground veal, pork or chicken, rice, herbs and spices cooked and thickened with a lemony avgolemono sauce. Purée the onion and garlic in the food processor with 2 tbsp olive oil. In a large bowl put the minced meat and add the pureed onion and garlic as well as the rice. Add the parsley, mint, tarragon, salt and pepper, egg white and mix well. Refrigerate for 1 hour. When ready to cook bring water or meat stock to a boil in a saucepan and add the remaining 2 tbsp olive oil and add some extra salt if you like. Until the water boils shape your meatballs, about the size of a walnut, (makes 50) and dredge into flour. Put the meatballs in the water and when froth forms on top remove with a slotted ladle. Lower heat and simmer for 20 – 30 minutes. In a bowl put the eggs, lemon juice and corn starch and whisk until the cornstarch dissolves. Slowly add a cup of broth from the pot while continuing to whisk. Prepare the avgolemono sauce and pour in the saucepan and quickly and mix for a few minutes. Let it rest for ten minutes until the soup thickens and serve while hot with extra black pepper on top. A twist I made to this traditional soup was to cook it with vegetables. I made a mirepoix in which I cooked the meatballs and then added the avgolemono sauce. You can leave the vegetables as they are in the soup or you can use a hand blender to purée them, before adding the meatballs. This is now my all time favourite giouvarlakia soup as the mirepoix adds much more flavour to the soup. Giouvarlakia are meatballs with starchy rice in a lemony avgolemono sauce. You can use ground veal or beef, pork, or a mixture of veal or beef and pork together or chicken or turkey mince, for a healthier soup. In this soup I made a mirepoix first and then added the meatballs. In a large bowl put the minced meat and add half of the puréed onion as well as the rice, the parsley, salt and pepper, the egg white and olive oil and mix well. Shape your meatballs, about the size of a walnut, and sprinkle with some flour. Heat the olive oil and sauté the remaining onion, add the carrot, celery and potato, chicken stock or bouillon and water and bring to a boil. Add the meatballs, lower heat and cook for half an hour or until the vegetables are soft. Remove any froth which forms on top with a slotted ladle. In a bowl put the egg yolks, egg white and lemon juice and whisk to combine. Slowly add a cup of broth from the pot while continuing to whisk. Pour the avgolemono sauce in the pot soup and tilt the pot for the sauce to go everywhere. If you are intolerant to gluten, you do not need to coat them with flour. The flour just helps to thicken the broth. Before cooking the meatballs, you can use a hand blender to puree the vegetables. I could see how this could be a comfort food! I’ve never tried it though, I’ll have to make your recipe! It’s a must for the cold days and nights and you’ve got plenty of them. I do like Avgolemono Soup. But I have never had it with the meatballs. Looks great, Ivy. True comfort food! Giouvarlakia is a much more filling soup and can be the main dish whereas Avgolemono is more like a starter. The meatballs would make this soup more like a meal…although I have a light appetite.I love all things with avgolemono!!! Hi Val and thanks for visiting. We do eat it like a light meal and yes I have read you commenting that in a restaurant in Greece everything had an avgolemono sauce on them (lol).